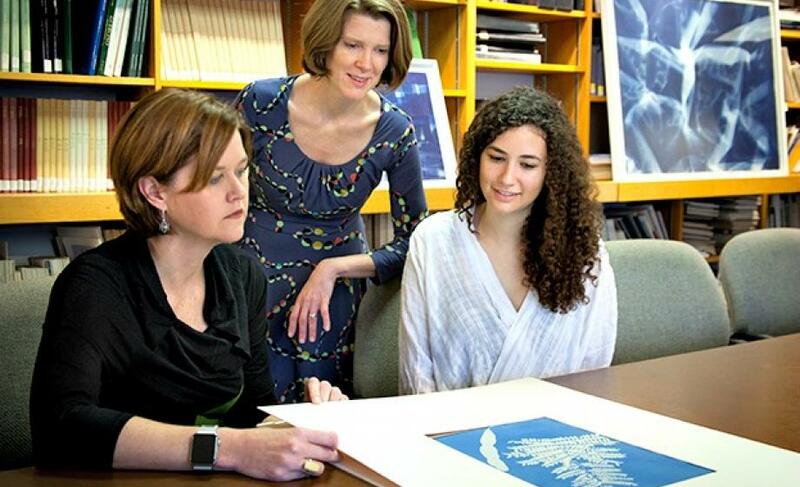 Kristina Wilson, associate professor of art history and chair of the Department of Visual and Performing Arts at Clark University, received a prestigious Award for Excellence in recognition of her groundbreaking new scholarship as co-curator of “Cyanotypes: Photography’s Blue Period,” a unique and popular exhibition mounted at the Worcester Art Museum (WAM) in 2016. Read more: Clark reframes an artistic partnership. Wilson (pictured above, center) and co-curator Nancy Kathryn Burns (pictured above, left), assistant curator of prints, drawings and photographs at the museum, received an Award for Excellence from the Association of Art Museum Curators (AAMC) and AAMC Foundation during the organizations’ annual conference and evening reception at the International Center of Photography on May 7. The AAMC received nearly 120 nominations for the 2017 awards and selected 26 curators for their work on some 17 projects, including exhibitions, catalogues, essays and digital publications, all mounted or published during 2016. “Cyanotypes: Photography’s Blue Period” was on display at the Worcester Art Museum from January 16 to April 24, 2016. The first-of-its-kind exhibition received national attention, including a feature in the New York Times as well as a segment on WGBH TV’s Open Studio with Jared Bowen. Eleven art history students from Clark University were deeply involved with the exhibition, working closely with Wilson in the classroom and beyond on research, preparation and installation. Several were on hand at a gala opening reception at WAM, where Clark has enjoyed a long legacy of collaboration. 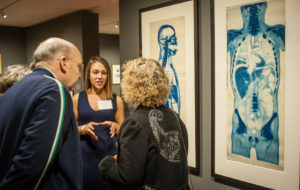 Casey Shea ’16 describes works exhibited at the opening reception of “Cyanotypes” at the Worcester Art Museum (Feb. 18, 2016). Invented by Sir John Herschel in 1842, cyanotypes are photographs with a distinctive Prussian blue tonality produced by treating paper with an iron-salt solution, developed using sunlight. Cyanotypes became a favored technique among amateur photographers through the turn of the 20th century. The 2016 WAM exhibition followed the progression of the earliest “blueprint photographs” to contemporary artists. The AAMC Awards are the only recognition of their kind by which curators directly honor the work of their colleagues, and are highly esteemed by art curators everywhere. Awards were distributed across fields of disciplines and institutional locations, highlighting the importance of curatorial engagement within our communities across the globe. Wilson received a B.A and Ph.D. from Yale University. She joined the Clark faculty in fall 2004. Her research has focused on American painting in the interwar years, the birth of modernist design in the United States in the early 20th century, and the history and criticism of museums. Wilson has published two award-winning books: “The Modern Eye: Stieglitz, MoMA, and the Art of the Exhibition, 1925-1934,” which was awarded the 2011 Charles C. Eldredge Prize for distinguished scholarship in American art by the Smithsonian American Art Museum; and “Livable Modernism: Interior Decorating and Design During the Great Depression,” which won the Charles F. Montgomery Book Award from the Decorative Arts Society and was accompanied by an exhibition at the Yale University Art Gallery in 2004-2005.